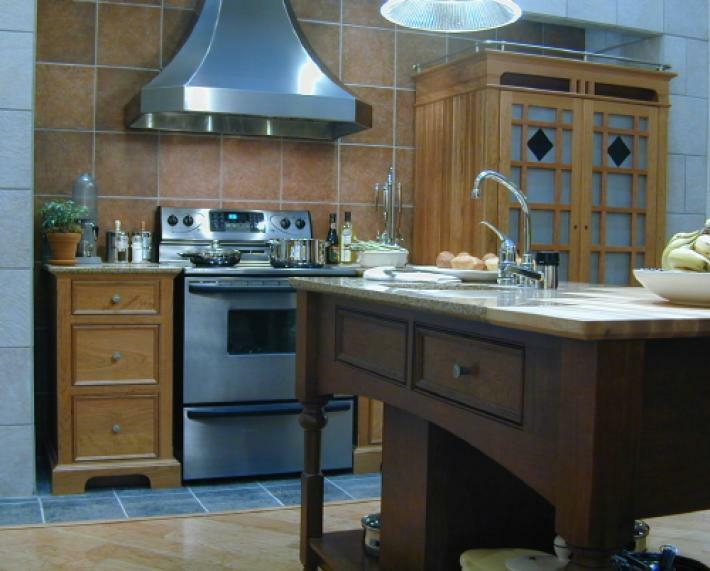 The Woman’s Day Kitchens and Baths Special Interest Publications exhibit at KBIS 2001, produced by Merv Kaufman, shows how Kitchen Workstation Furniture can blend with appliances that are not meant to be hidden. Here, two B18S pieces flank a conventional range. To the right of the range, our unfitted ‘Piesafe’ DO40-OO safely conceals two more ovens behind a custom set of grid doors. The freestanding island is a WT-A Work table, complete with a compartment to conceal the garbage disposer. The table is in Washington Cherry, the others are Natural Cherry. Note the butcher block top that was integrated into the granite countertop. Note: this was the second time that YesterTec was chosen for a KBIS display by Woman’s Day Specials. 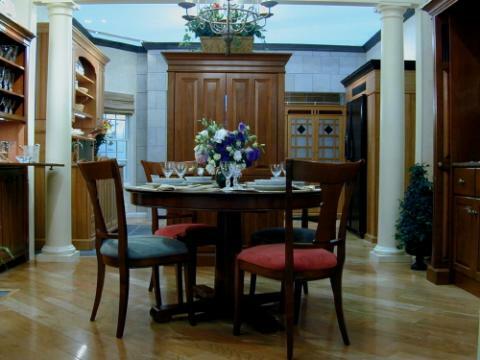 Our 1999 KBIS exhibit is shown here. The 8 foot high Sink Workstation (TP76-A-T/ST76U/S76U) shown above features extra landing countertop space above the normal countertop that greatly enhances food prep operations. Sliding ribbed glass doors partially storage areas for full sized plates or small appliances like toasters or coffee makers. 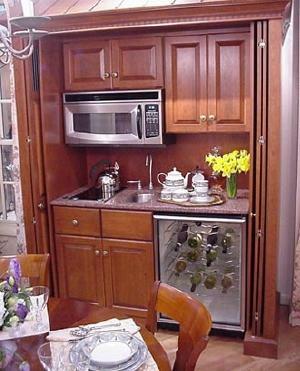 A standard dishwasher is concealed behind custom stenciled doors, here shown with the pocket doors in the open position. The freestanding butcher block cart to the right is by John Boos. 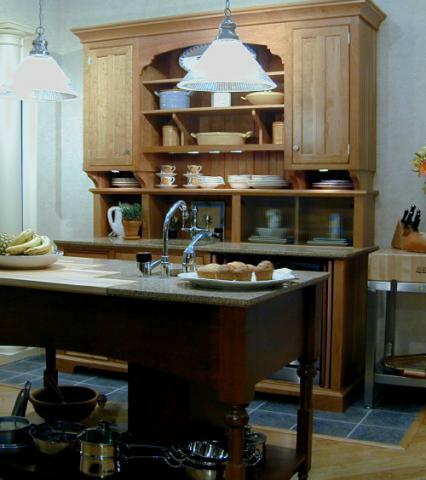 This shows how pieces other than ours can enrich the over all design and utility of a kitchen. We are not a fan of the separate tile flooring in front of the appliances, but tile needed to be used as the vendor was one of the sponsors of the KBIS exhibit. Typically whatever flooring is used in the kitchen should go wall to wall. The KBIS exhibit featured 9 YesterTec unfitted pieces. 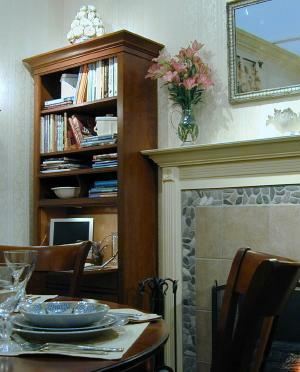 In the foreground was a formal dining area with a C32D computer desk cupboards to the left of the fireplace (shown below) and a C32C Dry Bar to the right. The room divider is an entertainment center DO40-EC. Behind it to the right is a PR36-FP Food Storage Refrigerator/ Pantry with an exposed black refrigerator and 2 full height flanking pantries. The Hospitality Armoire (shown below) was a bit of an overkill statement for the space, but we wanted to show how a 6 foot wide armoire could actually contain a whole kitchen or wet bar. 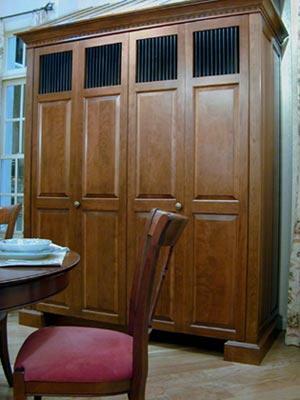 We have since discontinued the full height pocket doors as the hardware was too expensive to buy and install. This unit pre-dated our current UK68 and UK66-LE Mini-kitchen models that have the pocket doors only above the countertop. Notice (look hard) the sloped ‘roof’ on top of this piece! This detail can really turn a piece of furniture into a room’s focal point. 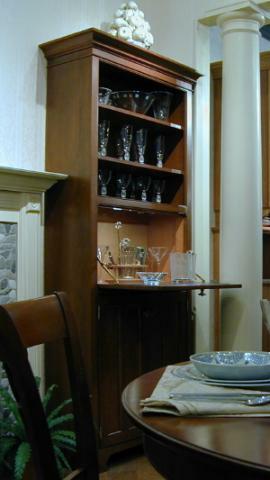 The laundry area featured the cupboard shown above made from one of our freestanding work tables and a hutch top. The washer and dryer and one of our sink pieces were located on the other side of the room.